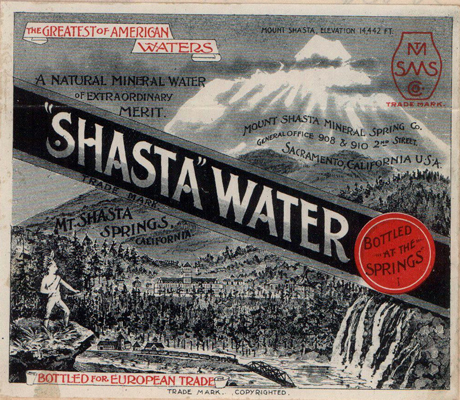 Shasta Water Trademark Sample from 1891, Trademark Records, Secretary of State, Corporations Division, Trademarks, 1888 to 2011, Washington State Archives, Digital Archives, http://www.digitalarchives.wa.gov. Did you know that the Washington State Archives has over 68,000 trademark applications from corporations registered in Washington? In 1891, the Mount Shasta Mineral Spring Company applied for a trademark. Formed in 1889, the company distributed naturally carbonated water from the springs of Mt. Shasta in northern California. In the mid-twentieth century the company expanded into the soda business. You can still find the brand, “Shasta” on many store shelves. This trademark from 1891 is one of the earliest trademarks in the Digital Archives. May Arkwright Hutton, Photographs, Spokane City Historic Preservation Office, 1878-1979, Washington State Archives, Digital Archives, http://www.digitalarchives.wa.gov. Born in 1862, May Arkwright was orphaned at a young age. Raised by her paternal grandfather, Arkwright was exposed to politics early on, attending many political rallies with her grandfather. In 1883 she moved to the Silver Valley of Idaho, where she set up a boarding house and quickly gained a reputation for her cooking. 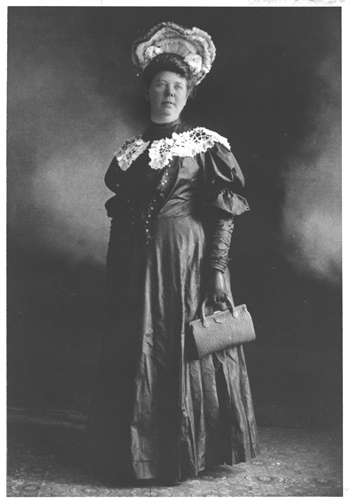 In 1887, she married Levi Hutton and the two moved to Wallace, ID and invested in a local mine. The couple was known for their politics, focusing on labor rights and women’s suffrage. Gov. 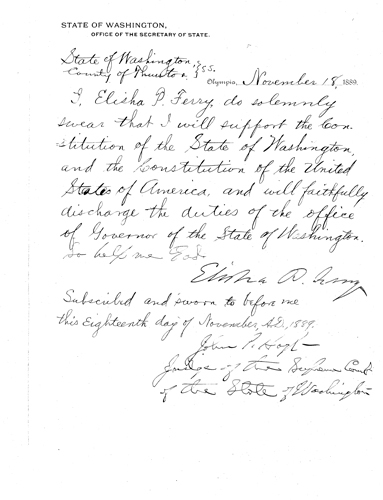 Elisha P. Ferry’s Oath of Office, Oaths of Office Series, 1854-2009, Washington State Archives, Digital Archives, http://www.digitalarchives.wa.gov. With another election year come and gone, it is good to reflect on the men and women who have taken up the reins of office in our state’s history. Elisha P. Ferry was sworn in on November 18th 1889 as the first Governor of the brand-new state of Washington, and above is his hand-written oath of office. A careful eye may notice subtle differences between the official constitutional oath of office and the one written by Ferry. Treasures of the Archives: Archives Open House in Cheney! Photograph image courtesy of Washington State Archives, Digital Archives, http://www.digitalarchives.wa.gov. Did you know that the world's first built-from-the-ground-up digital archive is in Cheney? It is true, and this Saturday, October 11 from 10 a.m. until 2 p.m. you can get special behind-the-scenes tours to see where the magic happens. Our facility is home to both the Digital Archives and the Eastern Region Branch of the Washington State Archives. 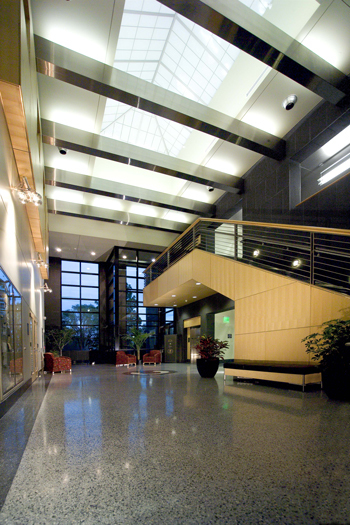 This state-of-the-art facility opened its doors in 2004. Downstairs, the Eastern Region Branch preserves precious physical historical records--everything from court transcripts of frontier-era divorces and murder trials to glass plate photographs of turn-of-the-century Spokane parks. We also have maps and marriage licenses and property record cards and naturalization papers and city council meeting minutes and--well, you get the picture. Archivist Lee Pierce will take visitors into the deep storage to show off some of the treasures that we protect. 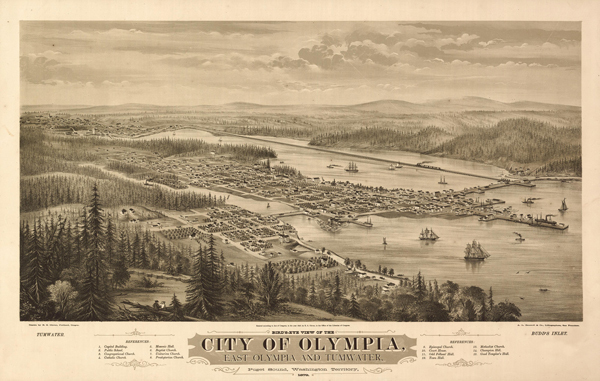 Bird's-eye view of the city of Olympia, Record Series, Map Records, General Map Collection, 1851-2005, Washington State Archives, Digital Archives, http://www.digitalarchives.wa.gov. Bird’s-eye maps of growing western towns were very popular in the late 19th-early 20th centuries. They offer an interesting perspective on the evolving landscape of the American West. They were not always accurate however. The artist would sometimes include interpretations of planned future developments in the map. This makes them a somewhat troublesome and untrustworthy source for those doing serious historical research. Those issues aside, they are a valuable and often aesthetically pleasing addition to any map collection. They offer a unique look into how the citizens of these cities and towns saw themselves and their future. 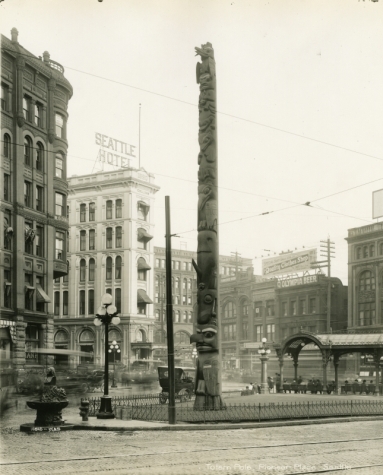 Totem pole, Pioneer Place, Seattle, Photographs, State Library Photograph Collection, 1851-1990 Washington State Archives, Digital Archives, http://www.digitalarchives.wa.gov. In the summer of 1899 a group of businessmen boarded the steamship City of Seattle for what was to be a sight-seeing and “good-will tour” sponsored by the Seattle Post-Intelligencer. The party went ashore near a Tlingit village. Finding hundreds of totem poles, they selected what they considered to be the best, and started cutting it down with axes as they would a tree. One of the men, James Clise, claimed that the “two decrepit Indians” present at the site of the totem “made no objection to our taking the pole to Seattle.” The totem the men stole that day was a memorial pole, which was made in honor of a female elder named Chief-of-all-Women after her death in 1870. 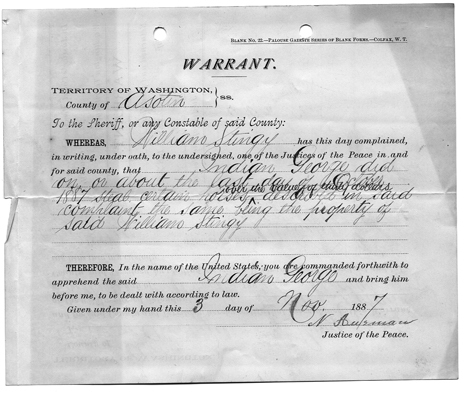 Criminal Horse Theft, Frontier Justice Series, Asotin Frontier Justice, 1887, Washington State Archives, Digital Archives, http://www.digitalarchives.wa.gov. In 1887, a Nez Perce man named William Stingy charged another man called “Indian George” with horse theft. Above is the warrant issued for his arrest in Asotin County, Washington. The case is curious in a few ways. Why did Stingy use the white justice system and not tribal remedies? Is this “Indian George” the same one who General Oliver Howard used in an attempted peace negotiation with Chief Joseph during the Nez Perce War? Perhaps you could be the intrepid researcher who provides an answer to these questions. 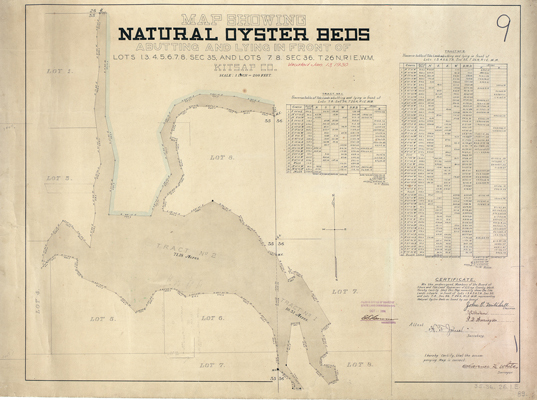 Map showing natural oyster beds, Map Records, General Map Collection, 1851-2005, Washington State Archives, Digital Archives, http://www.digitalarchives.wa.gov. The abundant natural resources of Washington State are recorded in many ways in the archives. This curious item is a map of natural oyster beds in Kitsap County, across Puget Sound from Seattle. 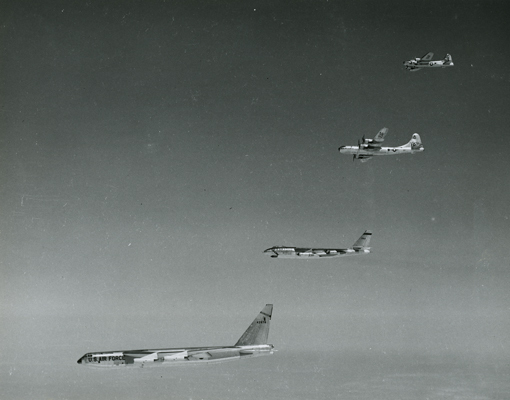 Boeing Bombers, Photographs, State Library Photograph Collection, 1851-1990, Washington State Archives, Digital Archives, http://www.digitalarchives.wa.gov. Boeing has a long and storied history in Washington State. Founded in 1917 in Seattle, the company made its first planes out of the readily available spruce wood of the Pacific Northwest. Achieving great success with flying boat designs, the company by 1930 had built some of the first commercial airliners in the world. 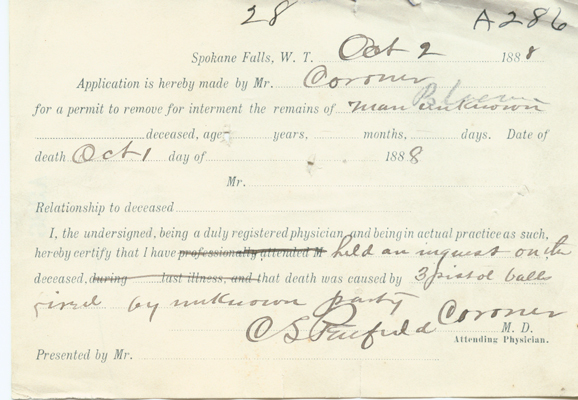 Unknown Death Certificate, Spokane County, 1888, Spokane County Death Return Collection, Washington State Archives, Digital Archives, http://www.digitalarchives.wa.gov. This death certificate is part of a 120 year old murder mystery. The deceased is listed simply as “man unknown.” He was shot three times on Oct 1st 1888 by an “unknown party.” The online Google News Archive provides another piece of the puzzle. In an October 4th 1888 article entitled “Midnight Murder,” the gruesome details of the crime are reported. 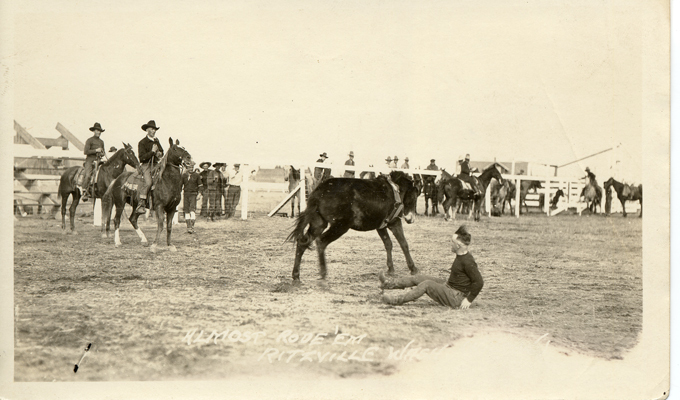 Ritzville Rodeo, Record Series, Photographs, A.M. Kendrick Collection, 1920, Washington State Archives, Digital Archives, http://www.digitalarchives.wa.gov. When A.M. Kendrick returned to Washington following WWI, he tried his hand at many different professions. He worked as a lumberjack, miner, farmer, and salesman before settling on country photographer. He set up shop in Ritzville, and over the next 50 years amassed one of the largest and most impressive collections of photographs in the Washington State Archives. The collection effectively documents the evolution of a small town from the 1920s to the 1970s. Clarence D. Martin Alumni House, Eastern Washington University. 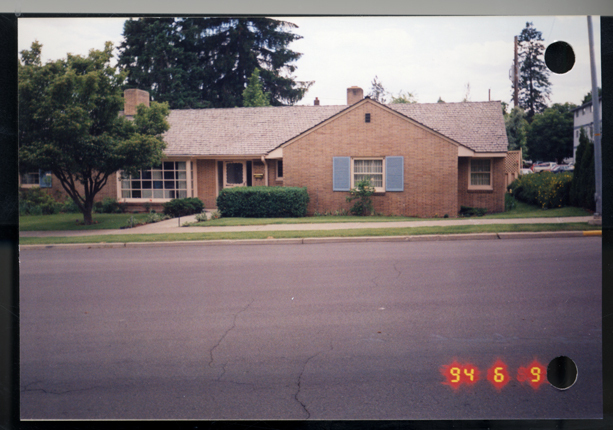 The Real Property Record Cards Collection, bulk dates: 1940 through 2004. Washington State Archives, Digital Archives, http://www.digitalarchives.wa.gov. Clarence D. Martin was one of Washington State’s most remarkable and influential governors. He was born in the small town of Cheney, Washington, and was serving as Mayor of Cheney when he won his bid to become Governor of the State, serving 1933 -1941. He continued to serve both as Mayor of Cheney and as the Governor from 1933 to 1936, commuting back to Cheney from Olympia at the end of each legislative session. After his time as Governor, Martin was appointed as a State Representative representing the 5th Legislative District in 1944, and later returning to the position of Cheney City Council Member, 1950-1952. George Barnett, Professional License Records, Department of Licensing, Business and Professions Division, Dental License Applications, 1888, 1909-1936, Washington State Archives, Digital Archives, http://www.digitalarchives.wa.gov. 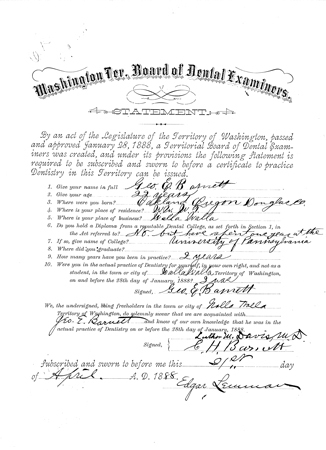 In 1888, the Legislature of Washington Territory passed an act to create the Territorial Board of Dental Examiners. Until that time, it was simply a matter of hoping for the best when going under the dentist's drill. Many dental practitioners of the 19th century, such as Walla Walla resident George E. Barnett seen above, practiced without a license or any formal education. Barnett lists an apprenticeship of one year at the University of Pennsylvania as his official training. As proof that he had been in practice for two years, Barnett provides witnesses, including one L.H. Barnett, very likely a close relative. The Dental License Applications, 1888, 1909-1936 collection is a fascinating little piece of early Washington history, useful for genealogy or general interest. Soldiers of the Great War, Washington, Vol. 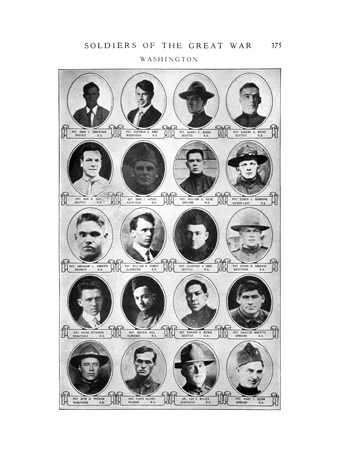 3, page 375, Soldiers of the Great War Casualty List, Military Records, Washington State Archives, Digital Archives, http://www.digitalarchives.wa.gov. It was November 1918, and Harry E. Requa of Seattle, along with the rest of the 361st infantry regiment, 91st division, moved from building to building in the Belgian town of Audenarde capturing German troops and weapons stockpiles. The 91st was tasked with assisting King Albert of Belgium in freeing the northwest of his country from a long German Occupation in what would later be known as the Ypres-Lys campaign. Requa’s unit faced artillery and snipers as it carried out its mission, and at some point on November 2nd 1918, he was killed in action. The Armistice which ended the war occurred a mere nine days later, making Requa one of the last casualties of WWI.